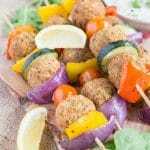 These falafel kebabs are made with ready made falafels, which makes them super quick and easy to put together. Ideal for a vegetarian BBQ or grill dish. Heat the oven to 200C/400F/GM6. Cut the onion into segments. Slice the courgette. De-seed the peppers and cut into 2cm squares. Place the vegetables in a small roasting tray, drizzle with oil and season with salt and pepper. Roast the vegetables for 12 minutes. Thread onto wooden skewers, alternating vegetables in between falafels. Roast the skewers for a further 12 minutes. You can use a pre-prepared packet of Mediterranean vegetables to save even more time. You can also partially roast the vegetables and assemble the kebabs in advance.